iSofter DVD to Pocket PC Converter helps you put your DVD movies on your Pocket PC with great quality! 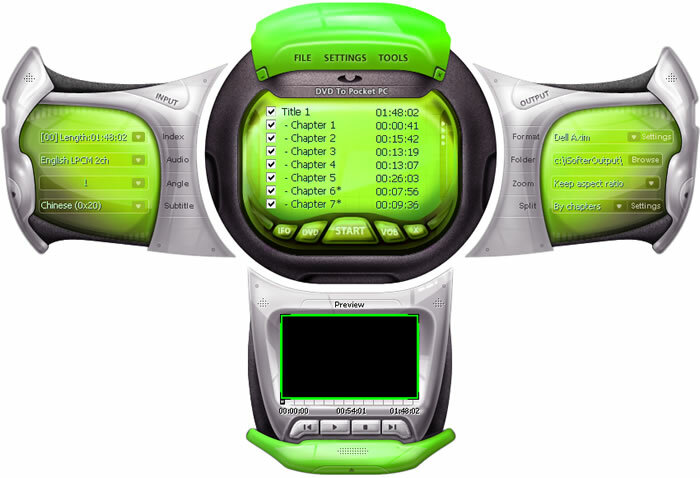 It can rip and convert DVD to Pocket PC video format WMV, audio format WMA and MP3. So easy to use that only a few clicks are enough. Feel inconceivable fast performance beyond your imagination Key Features: 1.Suited for both veterans and beginners 2.Super fast speed 3.Most functions can be called up with a simple mouse click or menu selection. 4.iSofter DVD to Pocket PC Converter is able to automatically detect the input video formats and then set the applications parameters for the best possible performance. ChiliBurner is the best way to save, share and enjoy your home video and audio masterpieces on CD and DVD. Turn AVI, MOV, MPEG, WMV files into DVDs. Create audio discs with your soundtracks. Do it with the most reliable burning software ChiliBurner. Fast Video to Audio Converter is a high speed and easy-to-use conversion tool to extract audio from AVI, MPG, MPEG, VOB, WMV, MP4, M4V, ASF, MOV, QT, 3GP, DAT, OGM, RM, RMVB, FLV, MKV, VRO to WAV, MP3, AC3, M4A, AMR, AAC. This converter helps you convert AMR to MP3 or any other audio formats with good quality and vice versa.You will also find it easy to merge or split, preview or snapshot, choose a predefined file format or manually set and save one of your own. Need4 Free 3GP Converter - is an easy-to-use and powerful 3gp converter allowing to save any unprotected DVD files and video to 3gp with the settings for best preview on your cell phone! Convert dvd, mp4, mpeg, mov, wmv, avi to 3gp for free. This site does not contain serial number, crack, keygen iSofter DVD to Pocket PC Converter serial number : serial number is the simplest type of crack. A serial number(cdkey,product key,etc) is register the program as you may already know. a crack or keygen may contain harmful software. If you cannot find the exact version you want, just give it a try. for more information read .nfo/.txt/.diz file include in zipped file.